Phylum Marchantiophyta are commonly known as the “liverworts” due to the shape of hepatic liverworts resembling the shape of the liver. According to an old medical doctrine, this resemblance indicated liverworts could cure illnesses of the liver. 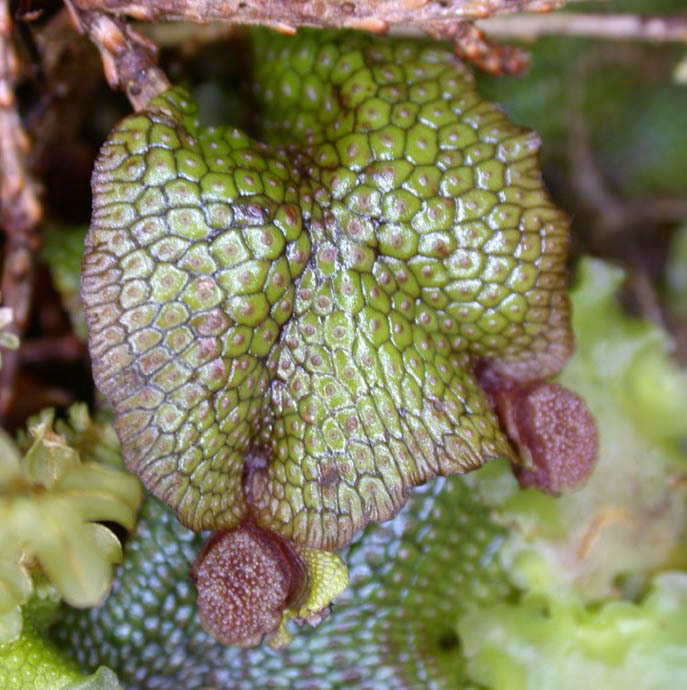 Liverworts are located on nearly every continent, inhabiting a diverse array of ecosystems. They may be found in harsh environments that many organisms find difficult to live and reproduce, however liverworts are not generally found in salty aquatic environments such as the ocean. Further, some species of Marchantiophyta rely on the photosynthate produced from other tracheophytes and mosses, as well as form symbiotic relationships with different groups of fungi (typically located on their rhizoids). However, this symbiotic relationship is not specific to species of liverworts or fungi, thus the two groups did not co-evolve together. The morphology of the free-living gametophytic generation varies within Marchantiophyta. There are many forms of gametophyte ranging from thalloid to leafy, and large to small. The isodiametric cells of the gametophore contain trigones, chloroplasts, and typically have oil bodies. The oil bodies are true membrane-bound organelles that vary in size, shape, number, color, and chemical composition among species. When liverworts are dried (such as for storage in a Herbarium) the oil bodies degrade at varying rates over time. The function of oil bodies is currently unknown, but they may serve to deter herbivores or aid in protection from the cold or UV rays. There is not a well-developed conducting system composed of hydroids and leptoids, however, endohydric water conduction does occur in some groups. At the apical regions of active mitotic cell division, mucilage is produced to protect against dehydration. Rhizoids are smooth and unicellular and serve to anchor and conduct water and minerals. The sexual reproductive structures are generally different from those of Bryophyta. 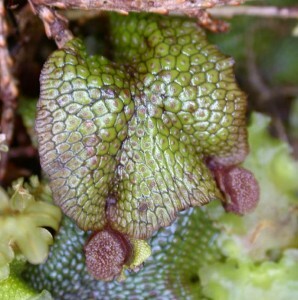 The archegonia are either contained within a modified region of the thallus known as an involucre (in thalloid liverworts) or a modified leaf known as the perianth (in leafy liverworts). There are no paraphyses present in either the female or male gametophytic regions. The sporophytic generation helps to classify Marchantiophyta. 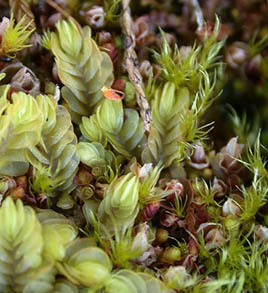 The unbranched sporophyte matures within the protective calyptra and female gametophyte. Once mature, the sporangium is elevated by the seta. Elongation occurs via water intake of thin-walled parenchymal cells within the seta. The increase in turgor pressure causes the cells of the seta to elongate (where as seta elongation in Bryophyta is due to cell division). Within the sporangium there are two types of cells developing from sporanogeous tissues, spore and elater mother-cells. Elater mother-cells develop into a single diploid cell with spiral wall thickenings, known as an elater. Spore mother-cells undergo meiotic divisions to become many haploid cells, known as a spores. The sporangium does not contain stomata, a columella, or peristome teeth. 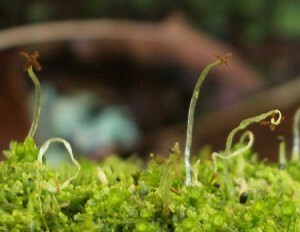 The mature sporophytic generation is short-lived with a brief period of spore dispersal by longitudinal lines of dehiscence on the sporangium. 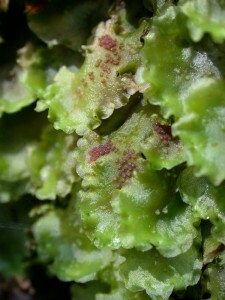 Spores may persist in the harsh environments liverworts may inhabit. When the spores germinate, they develop into a new branched and free-living gametophyte.